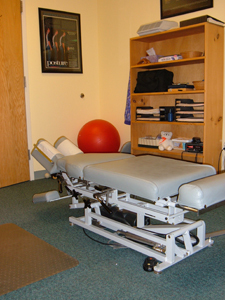 At Jacoby Chiropractic, we believe in a safe and effective whole-body chiropractic approach. Dr. Jacoby uses natural drug-free methods to maintain your optimal health including chiropractic adjusting, a variety of soft tissue massage techniques, rehabilitative exercises, orthotics, as well as ergonomic and nutritional counseling. Through chiropractic we can help you regain health and get back to living and doing the things you enjoy. Often when someone is experiencing symptoms such as pain, limited mobility or other discomfort, it can be a sign that a bone structure such as the spine or a joint has moved (subluxated) from its normal position. When this happens it can cause excess pressure and wear and tear on neighboring bones and tissues. The process is similar to the premature break down of the tires or other mechanics on your car when the alignment is off. In cases where the vertebrae are involved, the subluxation can impair proper nerve function because of the relationship between the spinal column, the spinal cord, and the spinal nerves. Once proper nerve function is compromised, communication within the body becomes less effective and can result in impaired health and decreased overall wellness of the individual. Simply put, subluxations can be caused by physical, chemical, and emotional stress. Physical causes include acute trauma to the body, repetitive motions, bad postural habits, improper workstation habits and design, and weak or imbalanced spinal musculature. Sustained poor posture can often be more damaging to the spine and nervous system than a motor vehicle accident. Chemicals which are harmful to the body decrease the body's ability to function optimally and reduce the ability to successfully adapt to and withstand internal and external stresses. This makes us more susceptible to subluxations. Chemical causes include poor dietary and nutritional practices, drug and alcohol use and abuse, and the ingestion of chemical toxins in the foods we eat, air we breath, and water we drink. Emotional stress, or inadequate stress management skills, can deplete the body of the ability to sustain normal functions. The impact of emotional stress on physical health is well documented in the medical research and can have devastating effects on the immune system, making the body susceptible to injury and disease. A chiropractic adjustment is a quick push or pull in the right direction(s) to place a joint into the correct position for maximum function. The adjustment is quick not hard. Doctors of chiropractic learn a variety of techniques that can be utilized to correct a subluxation. Most of these techniques will involve a chiropractic adjustment. This will either be performed by hand or by instrument. The technique utilized is determined by the patient's needs. For example, an infant with very elastic joints will receive a very different adjustment than a grown man. In either case, the chiropractic adjustment is very safe and comfortable. Subluxations generally require multiple adjustments for full correction to occur. Similar to straightening teeth, correcting malfunctioning and misaligned joints requires time for the tissues to accept this new position as normal.